Kindly contact us for help with your product selection, pricing, and / or help with ordering, Toll free: 1-800-626-0664. Whether running a single station or multiple line soldering stations, we can help you and your employees reduce their exposure to harmful, unhealthy soldering fumes, gas, odors as well the nuisance smoke. A cleaner work environment can help increase the morale, motivation, and the over-all well being of your employees and therefore can make a happier and more productive group of people. Contact us for help with your soldering fumes extraction needs, call us toll free, 1-800-626-0664, or fill out and send us the contact form on this page. We will get back to you soon as possible. All of our Quatro Air systems are UL/CSA/CE certified and are available in 110V or 230V versions for shipping internationally. Call us today about your application, no one has more experience in the print industry when it comes to clean, odor-free air. Effective fume extraction is critical to laser systems due to the possibility of toxic, carcinogenic corrosive or extremely odorous contaminants that can be generated. All of our systems feature multi-stage filtration incorporating a 2” Pre-filter section, 2” Certified HEPA filter and activated carbon modules. 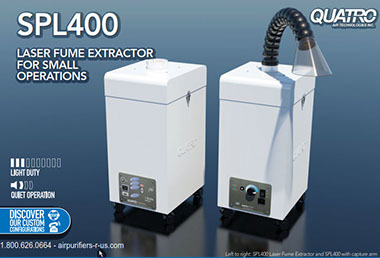 Whether your needs are Patient Isolation, General Purification, Particulate/Odor Source Capture, or Dust Collection, a QUATRO environmental air purifier will make a noticeable difference. Quatro engraving extraction systems are small, quiet and are designed with superior suction capabilities to overcome the small hosing and vacuum chip foot assemblies that are attached to the engraving head.